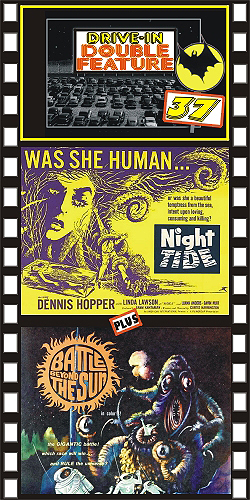 NIGHT TIDE (1961) Dennis Hopper, Linda Lawson, Luana Anders. An excellent low budget horror thriller similar to CARNIVAL OF SOULS. A lonely sailor on leave becomes fascinated with a sideshow mermaid girl. He faces a horrifying, growing awareness that she may actually be a real mermaid that habitually kills during the cycle of the full moon. Atmospheric and very chilling with memorable performances by all. Cool! From 16mm. PLUS: BATTLE BEYOND THE SUN (1963) Ed Perry, Andy Stewart, Bruce Hunter. Two nations race to have the first landing on Mars. Some great outer space scenes with really hilarious-looking monsters doing battle against each other. Some great outer space scenes. Nice color, 16mm.